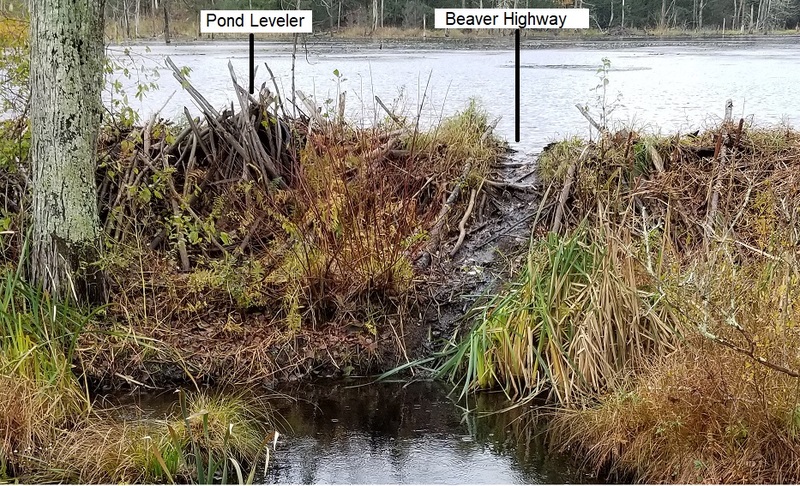 In the beginning of the month, I notice that for the first time since the installation of the culvert protection fence in 2011, the beavers made headway on blocking the outflow side of the culvert and they broke through cage the one weak spot in the inflow side. The broken cage was a 5 minute fix and the outflow blockage didn't concern me, because I knew that a significant rain would break through and wash it away. Murray Scott help with the repair and unblocked one of the pipes knowing that the beavers would do their thing overnight. I figured that the situation could be handled in spring with the construction of protection cage on the outflow side and was prepared to wait until then to do more detailed assessment of what was needed. Enter Mother Nature! Yesterday and last night we were under a weather alert for high winds and heavy rains. While many here were watching with concern, I have to admit that I was watching with optimistic anticipation. I knew that my theory about the outflow blockage would either be confirmed of proven wrong. I'm happy to say my prediction was confirmed. Not only that, to partial blockages that were previously unable to deal with, were broken free. This morning I donned my hip boots and cleared some of the debris to make it difficult for the beavers to do any more blocking of the outflow side. I don't have a BEFORE picture, but I have and AFTER picture that I doctored to simulate the BEFORE. On the other side of the pond, there the pond level rose considerably, but the pond leveler is doing its job perfectly. When I checked it this morning water was flowing over the dam in two places. The first is the pond leveler and the second is the Beaver Highway. The beavers will continue to be unaware of the flow through the leveler, but they will definitely notice the flow over their by-way. It's entirely possible the flow will stop by this evening, but if not, I'm curious to see if they leave it or try to repair it.